The Mazda CX-7 made its debut in April of 2006 as a 2007 model vehicle. It was the first mid-size SUV from Mazda in more than ten years, the previous being the Navajo which was discontinued in 1994. With clear design influences from Mazda’s RX-8 and Miata sports cars, it should come as no surprise that the CX-7 was praised as one of the sportiest mid-size SUVs on the market during the years it was being produced. Its steering is well-weighted and it takes turns quickly, but the vehicle always feels stable and there’s never a lack of control. Even with its aerodynamic design and nimble performance, it makes no sacrifices to interior space. It’s capable of seating up to five people comfortably and provides plenty of elbow-room even when every seat is filled. It also has a maximum cargo capacity of approximately 59 cubic feet, which should be more than enough to accommodate all sorts of exciting adventures. With the CX-7, Mazda created a crossover SUV that is not only incredibly practical but also fun to drive. The CX-7 was discontinued in 2012, but thanks to their reliability, you’re still likely to find plenty of early models on the road. 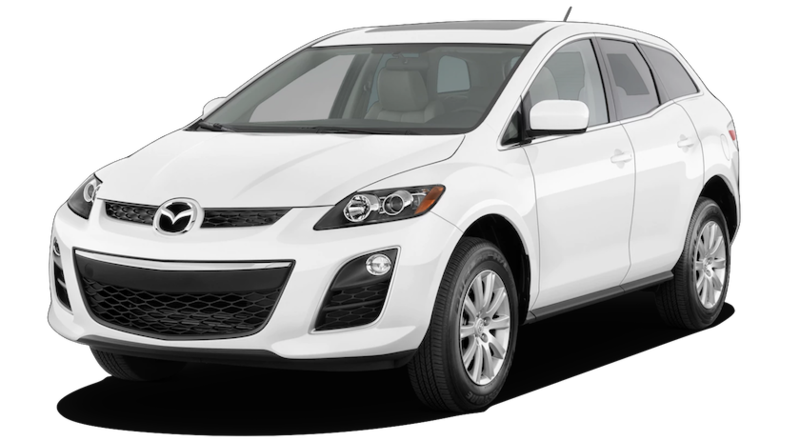 If you’re in need of an SUV, but you still want to have fun when you drive, it might be time to check out a used Mazda CX-7 for sale. Built with performance in mind, the 2007 model CX-7 comes equipped with a turbocharged 2.3-liter four-cylinder engine, providing 244 horsepower and 258 lb-ft of torque, coupled with a six-speed automatic transmission. A sports car at heart, the 2007 CX-7 can reach speeds of 60 MPH in only 7.7 seconds, and its braking abilities are superb. Its fuel economy is just average, though, at about 19 MPG in the city and 24 MPG on highways. Its maximum towing capacity is a modest 2,000 lbs, but even just that is enough for plenty of helpful hauling. Depending on the previous owner, any used Mazda CX-7 you find will feature either front-wheel drive or all-wheel drive. There’s nothing more important than the safety of you and your passengers, so it’s a good thing that the CX-7 performs so well in crash tests, even earning 5-star safety ratings in assessments done by the National Highway Traffic Safety Administration. All trim levels are fully equipped with antilock disc brakes, stability control, and a total of six airbags spread throughout the cabin, so you can enjoy driving with a peace of mind, knowing that both you and your passengers are in good hands. There are three possible trims that you’ll come across when looking at used Mazda CX-7s from 2007 or 2008. The base level trim, the Sport, comes with AC, power windows and mirrors, remote keyless entry with optional proximity lock/unlock, a massive center console, cruise control, and a touchscreen information display. Optional features include built-in navigation with voice activation, power glass tilting and sliding sunroof, remote engine start, 6-disc CD changer, 9 premium Bose speakers, and heated seats for the driver and front passenger. These extras are available as parts of various packages, the most popular of course being the technology package, which even includes a rearview camera with rear park-assist. The preferred equipment package is a more utility-focused bundle, featuring a step plate for the rear bumper, as well as a cargo net, cargo tray, and retractable cargo cover. The midlevel trim, the Touring, takes the Sport’s optional heated front seats and offers them standard, as well as giving seating all around a fine leather trim. It also improves driving position by offering an 8-way power driver seat. The Grand Touring is the top-level trim option for the 2007 CX-7. It features heated side view mirrors, automatic climate control, HID headlights, and a unique leather interior. The optional features available for the Sport trim are also available for the other two trim levels, so when you’re shopping for a used Mazda CX-7 you’re bound to see a number of different possible configurations. Most likely due to the fact that the CX-7 had just been released with the previous model year, there were no significant changes made to the 2008 model. If you were shown two used Mazda CX-7s, one from 2008 and one from 2009, you might not be able to tell the difference between them at first. There are no major changes to the exterior or interior design, and the powertrain remains the same as well. Performance is still the vehicles biggest highlight, with safety trailing closely behind. Despite an overall lack of change, there are a few minor quality of life improvements courtesy of a technology package update. The bundle now includes both satellite radio and Bluetooth phone pairing, and while these features might seem like unimportant changes, the convenience that they bring makes them invaluable additions, especially on longer drives. Included standard on every trim is an auxiliary audio jack, giving you access to all of your music without any need to bother with the CD player or multi-disc CD changer. The 2010 Mazda CX-7 was the first model to receive significant changes since the release of the 2007 model. The exterior styling of the vehicle has a few minor updates compared to previous models, most notably being a silver trim adorning the front of the vehicle and slightly smaller standard wheels. A new 2.5-liter four-cylinder standard engine provides 161 horsepower and 161 lb-ft of torque, and the turbocharged 2.3-liter is still available with the s Touring and s Grand Touring trim levels. The new standard engine has a much better fuel economy than its sibling, at 20 MPG in the city and 28 MPG on highways, but the turbocharged engine also receives some improvements to efficiency, now reaching up to 25 MPG on highways. In terms of safety, there are no significant changes, but seeing as earlier models already performed admirably in that area there was no need for major improvements. As expected, the 2010 CX-7 achieved the same glowing results during safety testing that its predecessors did. A new base level trim has been added, bringing the total number of trim levels to four. The new trim, the i SV, includes mostly the same standard features of earlier models’ base trims, with more differences appearing in changes to optional features. The i Sport trim adds tinted rear windows and leather-wrapped steering wheel and shift knob, as well as Bluetooth connectivity. The s Touring trim is closer to the older, punchier models, with the return of both the turbocharged 2.3-liter engine and 18-inch alloy wheels. It’s also equipped with high-quality leather upholstery, heated seats, and an 8-way power driver seat like the earlier Touring models. Dual exhaust outlets are also featured, and a rear cargo cover. The s Grand Touring is downright impressive, with top-of-the-line features that propel the CX-7 to a new level of convenience. Automatic xenon headlights, foglights, and automatic windshield wipers help with visibility, as do heated side view mirrors and an auto-dimming rearview mirror. Built-in navigation is helpful and easy to use, allowing you to find your destination without worrying about how much data you have left on your phone plan. Electroluminescent gauges, automatic climate control, unique leather upholstery, driver seat memory settings, a Bose premium audio system, and power passenger seating all give the s Grand Touring an interior that feels luxurious and modern while still being incredibly affordable. The Mazda CX-7 didn’t receive many noteworthy changes in 2011, but it did gain an additional trim, the i Touring. The i Touring uses the 2.5-liter engine used by the i SV and i Sport trims, but adds leather upholstery, a premium Bose audio system, and built-in navigation. The newest used Mazda CX-7s that you’ll find will be from the 2012 model year. There were no significant changes to the vehicle for its final year in production. If you’re looking for a solid selection of reliable used vehicles to choose from, there’s nowhere better than McCluskey Automotive. With our expansive inventory consisting of hundreds of new and used models, we’re confident that we’ve got a vehicle that’s just right for you. Whether you’re thinking about a new sedan, a used pickup truck, or anything in between, our expert customer service team has the knowledge and the passion to help you find your perfect fit. Our financial specialists are at the ready, using their expertise to help you reach the best price possible for your new or used vehicle. Even if you don’t have the best credit, we offer a wide range of financing options so that you can find a payment plan that works within your budget. The next time you find yourself in the market for a new or used vehicle, come visit us at McCluskey Auto. We’re excited to help you get behind the wheel of your perfect car, so schedule a test drive today!